60cm (2ft) tall includind trellis, this is the ideal solution for keeping your climbers upright! A compact metallic-effect planter with removable inbuilt trellis featuring little birds, reaching to 60cm. Perfect for adding a little height to patios, terraces, balconies and smaller spaces. Ideal for shorter sweet peas. compact clematis, black eyed Susan (Thunbergia), and shorter climbers, and also vegetables like short patio peas, beans and similar. Finished in a coffee creme paint for a classic, elegant effect. Volume 7.6litres. 29cm diameter, Height inclusive of trellis when fixed is 60cm (2ft). A delightfully whimsical planter, with removable inbuilt trellis, reaching to 60cm. 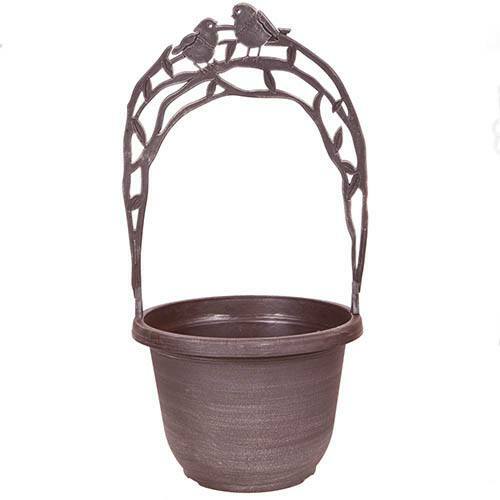 The decorative trellis is removeable and features a sweet bird silhouette, which arches gracefully over the pot. Ideal for shorter sweet peas. black eyed Susan (Thunbergia), and shorter climbers, and perfect for the new breed of short patio peas, beans and similar, as well as the ultra-compact Boulevard clematis series. Volume 7.6litres. 30cm (12in) diameter, Height inclusive of trellis when fixed is 60cm (2ft). Made from a durable UV-stable and frost-resistant plastic, and hand painted with a Coffee-creme finish. Complete with trellis as separate part that simply clips on.